Ahmad Shāh Durrānī (c. 1723 - 1773) (Pashto/Persian: احمد خان درانی), also known as Ahmad Shāh Abdālī (Pashto/Persian: احمد خان ابدالی) and born as Ahmad Khān Abdālī, was the founder of the Durrani Empire and is regarded by many to be the founder of modern Afghanistan. The Pashtuns of Afghanistan often call him Bābā ("father"). He also used the title "pearl of pearls," or "pearl of the age" (Durr-i-Durrani), hence the name of his dynasty. Following the assassination of Nader Shah Afshar, he became the Amir of Khorasan. After consolidating his rule over territory stretching between Amu Darya and the Indian Ocean and from Khorasan into Kashmir, the Punjab, and Sind he invaded India on nine occasions. At the time, only the Ottoman Empire was larger in the Muslim world. In 1757, he sacked the cities of Delhi, Agra, Mathura, and Vrndavana, but made no attempt to establish rule there. He confronted the Sikhs in the Punjab during an extended campaign, eventually abandoning that region. Faced with unrest at home towards the end of his life, he concentrated on domestic matters. He replaced weak regional rulers in his Empire with a strong centralized government. His policy of appointing counselors drawn from the most important tribal sirdars helped to unite these traditionally fractious units under his rule. Unable to maintain this unity, his successors oversaw the Empire's disintegration into smaller, rival units. Ahmad Shāh Durrānī's legacy suggests that, faced with a history of strong tribal and weak national authority, unity can be achieved by sharing power between the center and local elites. However, this unity was fragile, requiring more nurture than his heirs were able or willing to provide. The key challenge facing Afghanistan today remains the task of building a genuine, indigenous national unity that transcends historical tribal loyalties. Ahmad Shāh Durrānī is remembered as a just and moderate ruler. He was also a poet. The last Durrani ruler, Ayub Shah, died in 1823, ending the dynasty. Ahmad Khan (later Ahmad Shah), from the Sadozai section of the Popalzai clan of the Abdali tribe of the Pashtuns, was born in Multan, Punjab. He was the second son of Mohammed Zaman Khan, chief of the Abdalis. In his youth, Ahmad Shah and his elder brother, Zulfikar Khan, were imprisoned inside a fortress by Hussein Khan, the Ghilzai governor of Kandahar. Hussein Khan commanded a powerful tribe of Afghans. Conquering the eastern part of Persia a few years previously, he had threatened the power of the Safavids. In around 1731, Nader Shah Afshar, the new ruler of Persia and founder of the Afsharid Dynasty (1736-1796), began enlisting the Abdalis in his army. After conquering Kandahar in 1737, Ahmad Khan and his brother were freed by the new Persian ruler. The Ghilzai were expelled from Kandahar and the Abdalis were allowed to settle there instead. Nader Shah favored Abdali due to his young and handsome features, and gave him his title of “Dur-i-Durran” (Pearl of Pearls). Subsequently, Ahmad Khan changed the Abdali tribe's name to the Durrani tribe. Proving himself a loyal and capable officer in Nader Shah's service, Ahmad Khan and was promoted from a personal attendant (yasāwal) to command a cavalry of Abdali tribesmen. He then quickly rose to command a cavalry contingent estimated at four thousand strong, composed chiefly of Abdalis, in the service of the Shah on his invasion of India in 1738. Deli was sacked, and the famous Peacock Throne of the Moghul Emperors, together with the Koh-i-Noor diamond were taken back to Persia. Popular history has it that the brilliant but megalomaniac Nader Shah could see the talent in his young commander. Later on, according to Pashtun legend, it is said that Nader Shah summoned Ahmad Khan Abdali and informed him that when he was dead, kingship in the region would pass to Ahmad Khan Abdali but that he ought to treat his (Nader Shah's) heirs kindly. Ahmad is reported to have responded by pledging himself to serve Nader Shah as he wished, even to die for him or to be slain for him. Moreover, there was no need to express any concern about the future safety of his children. Nader Shah's rule abruptly ended in June 1747, when he was assassinated (probably a result of his somewhat despotic rule). The Turkoman guards involved in the assassination did so secretly so as to prevent the Abdalis from coming to their King's rescue. However, Ahmad Khan was told that Nader Shah had been killed by one of his wives. Despite the danger of being attacked, the Abdali contingent led by Ahmad Khan rushed either to save Nader Shah or to confirm what had happened. When they reached the King's tent, they saw Nader Shah's dead body and severed head. Having served him so loyally, the Abdalis wept at having failed their leader, and headed back to Kandahar. On their way, the Abdalis decided that Ahmad Khan would be their new leader, and already began calling him Ahmad Shah. Later the same year (1747), the chiefs of the Durrani (Abdali) tribes met near Kandahar for a Loya Jirga to choose their new leader. For nine days, serious discussions were held among the candidates in the Argah. Ahmad Shah kept silent by not campaigning for himself. At last Sabir Shah, a religious chief, emerged from his sanctuary and addressed the gathering. He told the Jirga that he could find no one who was more worthy of leadership, or who was more trustworthy and talented, than Ahmad Khan. The leaders agreed unanimously. Ahmad Khan was chosen to lead the tribes. Coins where struck for his coronation as Padshah, which occurred in October 1747, near the tomb of Shaikh Surkh, adjacent to Nadir Abad Fort. One of Ahmad Khan's (now Ahmad Shah) first act as chief was to adopt the title "Durr-i-Durrani" ("pearl of pearls" or "pearl of the age"), since Nader Afshar had always used this title for him. Following his predecessor, Ahmad Shah set up a special force closest to him consisting mostly of his fellow Durranis, Tājiks, Kizilbāshes, and Yūzufzais. Ahmad Shah began his military conquest by capturing Ghazni from the Ghilzai Pashtuns. He then took Kabul from the local ruler, thus strengthening his hold over eastern Khorasan, comprising most of present-day Afghanistan. Leadership of the various Afghan tribes rested mainly on the ability to provide booty for the clan, and Ahmad Shah proved remarkably successful in providing both booty and military action for his followers. Apart from invading the Punjab three times between the years 1747-1753, he captured Herāt in 1750, and both Nishapur (Neyshābūr) and Mashhad in 1751. Ahmad Shah first crossed the Indus river in 1748, the year after his ascension. His forces sacked Lahore during that expedition. The following year (1749), the Moghal ruler was induced to cede Sindh and all of the Punjab west of the Indus River to him, in order to save his capital from being attacked. Having gained substantial territories to the east without a fight, Ahmad Shah turned westward to take possession of Herat, which was at the time ruled by Nadir Shah's grandson, Shah Rukh of Persia. The city fell to Ahmad Shah in 1750, after almost a year of siege and bloody conflict. Ahmad Shah then pushed on into present-day Iran, capturing Nishapur and Mashhad in 1751. Meanwhile, in the preceding three years, the Sikhs had occupied the city of Lahore, so Ahmad Shah had to return in 1751, to oust them. In 1752, he invaded and reduced Kashmir. In 1756/57, in what was his fourth invasion of India, Ahmad Shah sacked Delhi and plundered Agra, Mathura, and Vrndavana. However, he did not displace the Mughal dynasty, which remained in nominal control as long as the ruler acknowledged Ahmad's suzerainty over the Punjab, Sindh, and Kashmir. He left the Mughal Emperor, Alamgir II, on the throne as a puppet, and arranged marriages for himself and his son Timur into the Imperial family that same year. He married a daughter of the Mughal emperor Muhammad Shah. Leaving his second son, Timur Shah (who was married to the daughter of Alamgir II), to safeguard his interests, Ahmad finally left India to return to Afghanistan. On his way back, he could not resist attacking the Goldern Temple in Amristar and filled its sarovar (sacred pool) with the blood of slaughtered cows and people. The Golden Temple's significance and sanctity to the Sikhs can be compared with what Mecca is to the Muslims, so this act initiated a long period of bitterness between Sikhs and Afghans. The Mughal power in northern India had been declining since the reign of Aurangzeb, who died in 1707. The Hindu Marathass, who already controlled much of western and central India from their capital at Pune, were straining to expand their area of control. After Ahmad Shah sacked the Moghal capital and withdrew with the booty he coveted, the Marathas filled the power void. In 1758, within a year of Ahmad Shah's return to Kandahar, they secured possession of the Punjab, and succeeded in ousting his son Timur Shah and his court from India. At stated periods, Ahmad Shah held what is termed a Majlis-e-Ulema, or Assembly of the Learned, the early part of which was generally devoted to divinity and civil law—for Ahmad Shah himself was considered to be a Molawi (master) and concluded with conversations on science and poetry. As a rule, he did not meddle with the tribes or their customs as long as they did not interfere with his ambitions. He appointed a Prime Minister and a Council of Nine lifetime advisers, all of whom were leaders (sirdars) of the main tribal factions. This was a deliberate effort to overcome the tendency towards disunity and inter-tribal conflict that was then, and which still is, a characteristic of the region. 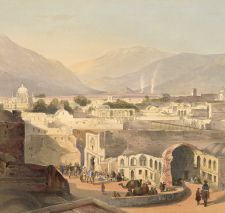 A painting of Kandahar, Ahmad Shah Durrani's capital city, with his tomb (background left). Lithograph, James Rattray, 1848. The victory at Panipat was the high point of Ahmad Shah's and Afghan power. His empire was by now among the largest in the world at the time, second only to the Ottoman Empire in the Muslim majority world. However, this situation was not destined to last very long, and the empire soon began to unravel. As early as the end of 1761, the Sikhs were rebelling in much of the Punjab. In 1762, Ahmad Shah crossed the passes from Afghanistan for the sixth time to crush the Sikhs. He assaulted Lahore and Amritsar. Within two years, the Sikhs rebelled again, and he launched another campaign against them in 1764, resulting in a severe Sikh defeat. During his eighth Invasion of India, the Sikhs vacated Lahore, but faced Abdali's army and general, Jahan Khan. The fear of his Indian empire falling to the Sikhs continued to obsess Ahmad Shah's mind and he set out on another campaign against Sikhs towards the close of 1766. This was his ninth and final invasion into India. The Sikhs had recourse to their old game of hide and seek. Again, they vacated Lahore then faced squarely the Afghan general, Jahan Khan at Amritsar, forcing him to retreat. Six thousand of Abdali's soldiers were killed. Jassa Singh Ahluwalia, with an army of about twenty thousand Sikhs, then roamed the neighborhood of the Afghan camp plundering it to his heart's content. Ahmad Shah's dream of capturing the whole of India was dying before his own eyes. After this, the Sikhs ruled the region up until until 1849, when they lost to the British in the Second Anglo-Sikh War. In the spring of 1761, Ahmad Shah, returned to Kabul. From that period until the spring of 1773, he was actively employed against foreign and domestic enemies. His health, which had been declining for some time, continued to get worse, preventing him from engaging in any foreign expeditions. His complaint, a face cancer, had first afflicted him in 1764. This finally caused his death. He died at Murghah, in Afghanistan, in the beginning of June 1773, during his fiftieth year. He was succeeded by his son, Timur Shah Durrani. Ahmad Shah's successors, beginning with his son, Timur, proved largely incapable of governing the Durrani empire. Faced with advancing enemies on all sides, the empire collapsed within 50 years of Ahmad Shah's death. Much of the territory that he had conquered fell to others during this half century. Instead of sharing power with the sirdars, the later Durrani rulers alienated them by assuming absolute power and gathering advisers around them who were royal favorites rather than traditional tribal leaders. By 1818, Ahmad Shah's heirs controlled little more than Kabul and the surrounding territory. They not only lost the outlying territories, but alienated other Pashtun tribes as well and those of other Durrani lineages. Until Dost Mohammad Khan's ascendancy in 1826, chaos reigned in Afghanistan, which effectively ceased to exist as a single entity, disintegrating into a fragmented collection of small units. Ahmad Shah's victory over the Marathas also influenced the history of the subcontinents and, in particular, British policy in the region. His refusal to continue his campaigns deeper into India (and inevitably clash with the British East India Company) allowed the East India Company to continue to acquire power and influence after their acquisition of Bengal in 1757. However, fear of another Afghan invasion would long haunt British policy makers. The acknowledgments of Ahmad Shah’s military accomplishments are reflected by British intelligence reports on the battle of Panipat, which referred to Ahmad Shah as the "King of Kings." 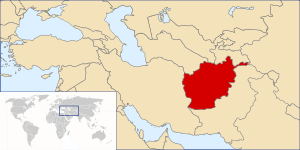 Fear of an alliance between the French and Afghans resulted in a series of diplomatic missions to forge anti-French alliances, including one in 1798, to Persia. Mountstuart Elphinstone was sent to Afghanistan in 1808 (as the first British envoy—remaining there until 1811, when he was transferred to the Maratha capital), where he secured a treaty with the then ruler, Shah Shuja (who was overthrown very soon afterwards). The King of high rank, Ahmad Shah Durrani, Was equal to Kisra in managing the affairs of his government. In his time, from the awe of his glory and greatness, The lioness nourished the stag with her milk. From all sides in the ear of his enemies there arrived A thousand reproofs from the tongue of his dagger. The date of his departure for the house of mortality Was the year of the Hijra 1186 (1772 C.E.). His military courage and activity are spoken of with admiration, both by his own subjects and the nations with whom he was engaged, either in wars or alliances. He seems to have been naturally disposed to mildness and clemency and though it is impossible to acquire sovereign power and perhaps, in Asia, to maintain it, without crimes; yet the memory of no eastern prince is stained with fewer acts of cruelty and injustice. Ahmad Shah wrote a collection of odes in his native Pashto language. He was also the author of several poems in Persian. ↑ Encyclopedia Britannica, Ahmad Shah Durrani. Retrieved April 19, 2008. ↑ Library of Congress Country Studies, Afghanistan, Ahmad Shah and the Durrani Empire. Retrieved April 19, 2008. ↑ H.M. al-Munshi, Tarikh Ahmad Shahi (Moscow: Idara-i-Intisharaat Danish Shob̀a Adabiyaat Khawar, 1975), p. 30. ↑ C. Collin-Davies, "Ahmad Shah Durrani," Encyclopedia of Islam (Leiden, NL: Brill, ISBN 9004113185). ↑ John C. Griffiths, Afghanistan: A History of Conflict (London: Carlton Books, 2001, ISBN 1842225979), p. 12. ↑ Olaf Caroe, The Pathans (Oxford: Oxford University Press, 1983, ISBN 0195772210). ↑ Story of Pakistan, Shah Wali Ullah (1703-1762). Retrieved April 19, 2008. ↑ H.G. Keene, The Fall of the Moghul Empire of Hindustan, emotional-literacy-education.com. Retrieved April 19, 2008. ↑ The British Library, Summary: The emergence of the Afghan Kingdom and the Mission of Mountstuart Elphistone, 1747-1809. Retrieved April 19, 2008. ↑ Mountstuart Elphinstone, An Account of the Kingdom of Cabul and its Dependencies in Persia, Tartary (London: Longman, Hurst, Reese, Orme and Brown, and J. Murray, 1815). Durrani, Ahmad Shah. 1963. Diwan-i Ahmad Shah Abdali. Peṣhawar: Puṣhtū Akeḍemī da Peṣhawar Yūnīwạrsaṭī. Karim, Munshi Abdul, Mir Waris Ali (trans.). 1963. Waquiyat-i-Durrani. Lahore, PK: Punjabi Adabi Akadami. Misdaq, Nabi. 1997. Ahmad Shah Durrani, 1722-1772: Founder and First King of Modern Afghanistan: Revolutionary Reformer, Poet or Feudal Lord? Delhi, IN: Irfan Cultural Center. Prakash, Om. 2002. Marathas and Ahmad Shah Abdali. New Delhi, India: Anmol. ISBN 9788126110834. Raj, Kashi. 1974. Panipat ki Akhiri Jang. Lāhaur: Sang-i Mīl Pablīkeshanz. Singer, Andre. 1983. Lords of the Khyber. The Story of the North West Frontier. London: Faber and Faber. ISBN 0571117961. Singh, Ganda. 1959. 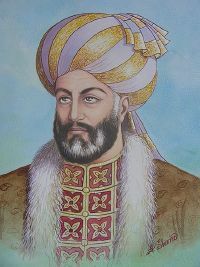 Ahmad Shah Durrani. Father of Modern Afghanistan. Bombay, IN: Asia Publishing House. Tanner, Stephen. 2002. Afghanistan: A Military History from Alexander the Great to the Fall of the Taliban. New York: Da Capo Press. ISBN 0-306-81164-2. Verma, B.R., and S.R. Bakshi. 2004. "Marathas : Rise and Fall." In Encyclopedic Survey of Medieval India. New Delhi, IN: Commonwealth Publishers. ISBN 8171698875. The story of the Koh-i Noor. History of "Ahmad Shah Durrani"
This page was last modified on 9 February 2019, at 16:58.